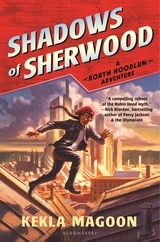 Shadows of Sherwood (Robyn Hoodlum) by Kekla Magoon. Bloomsbury USA Children's Books. 2015. Review copy from publisher. The Plot: A Robin Hood retelling, with Robyn Loxley as a twelve year old girl who seeks her imprisoned parents and allies herself with the have-nots of her world. The Good: I love retellings, I love seeing what is kept, what is changed, how it's updated. Confession: this is one of those books that while I'd heard a bunch of buzz, I'd avoided most reviews, wanting to read it fresh. The cover told me that the retelling was also updating the setting, putting Robyn in a modern world. Well, I was wrong. And right. Yes, it's a modern world but it's not our modern world. The technology seems about fifty years in the future; the city is Nott City, and the discussion of the city and its surroundings, while matching the Robin Hood tales, doesn't match our own geography. So it's not just a retelling; it's a fantasy, in that it's not our world. But it's so close to our world, that even non-fantasy readers will enjoy it. And the names of places and people will make those familiar with Robin Hood smile: Loxley Manor, the Castle District, people named Tucker and Scarlet and Merryan. Robyn is amazing. Awesome. Courageous, stubborn, smart -- and a bit spoiled. She's the child of privilege who likes to sneak out at night. It's the sneaking out that saves her, when her politically involved parents are taken as part of a coup. Suddenly, she's without anything or anyone and is forced beyond the borders of her comfortable life. For example: Robyn isn't even familiar with money or trading, because chips and credit have always covered her needs. But as she meets others -- a young girl living on her own, a boy who is hiding something -- she adjusts. Forced to be an enemy of those in charge, she quickly sides with the others who are enemies of those in power: the poor, those without connections, those living hand to mouth. Robyn is biracial; her parents, and their backgrounds, are part of the story and even mystery Robyn is trying to uncover. Mystery may be the wrong word; but while her parents now have powerful connections and jobs, allowing for Robyn's very upper class upbringing, Shadows of Sherwood quickly sketches in the background of their lives and world. And their background is what targeted them during the current coup, and their lives before Robyn's birth is part of what she needs to learn more about to figure out her own present and future. Robyn's hair is braided, and it turns out it's a distinctive style taught to her by her father. It's unique; and when she is alone, seeing another with the same style of braid is one of those clues. While this is not our world, it's a world where skin color and money matter, just in different ways. So while there is the adventure of survival, and helping others, there is also the mystery of the past and the future and finding her parents. This is the start of a series, and so it's Robyn's origin story. Who she was. How she becomes Robyn Hoodlum, robbing from the rich to give to the poor. With that told; and with the start of her "merry band" coming together, I look forward to what Robyn and her crew will do next. Because Robyn is terrific. Because the world building is so full. Because it's an inventive retelling that is also true to the source. Because I want more. Shadows of Sherwood is a Favorite Book of 2015. Meanwhile, while waiting for more Robyn, over at Nerdy Book Club the author, Kekla Magoon, shares a bit about writing this book. This sounds so great. The pedigree is already just about perfect -- I love my lady Kekla Magoon, and I love Robin Hood adaptations -- so I'm really excited that you enjoyed it so much. Can't wait to get it from the library!